The Mondrian Hotel rooms & suites are infused with unique features and custom detailing created by international design star Marcel Wanders. 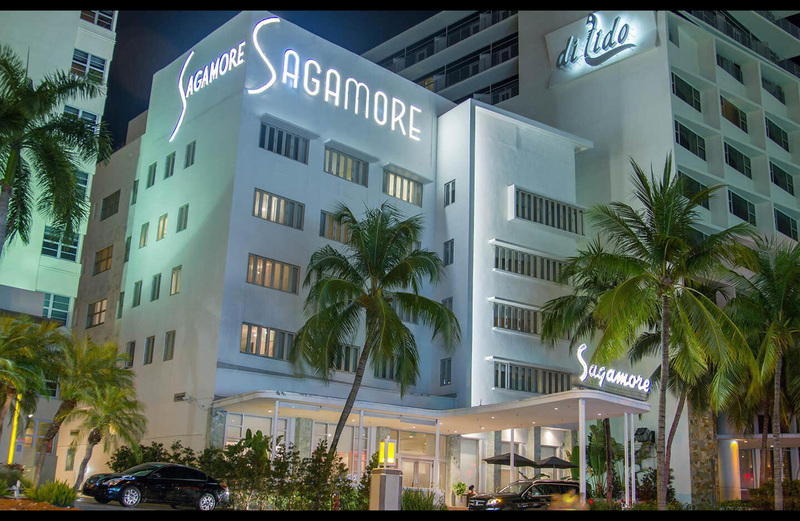 Step into a magical wonderland that surprises and delights with stunning views of Biscayne Bay. Custom-designed furniture, rugs and wall-coverings create a provocative yet luxurious environment. Superlative amenities include cotton linens, down duvet, entertainment on demand, 42” plasma TV, in-room wireless and sumptuous bath products from GUYandGIRL. One-of-a-kind features include a trompe l’oeil mirror and Dutch Delft tiles with modern Miami designs. 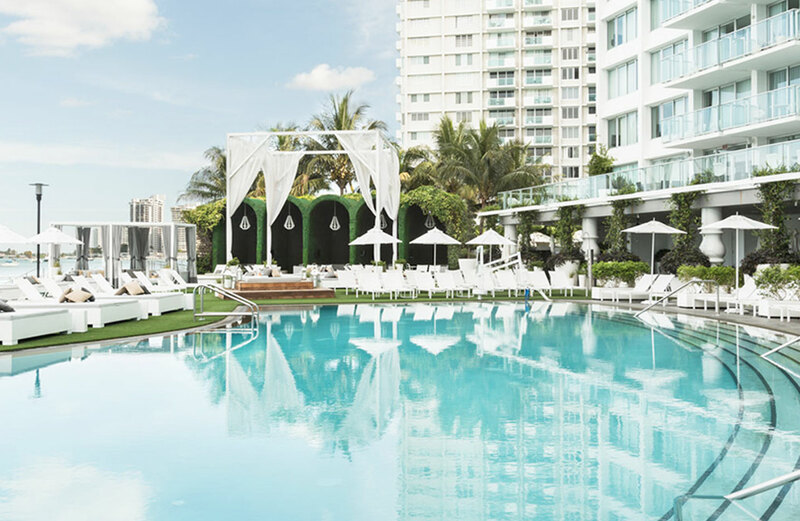 Mondrian South Beach's hotel pool is a pool surrounded by sun-soaked lounge pillows, lush gardens hung with hammocks, secret pathways and kissing corners. Take in spectacular views of Biscayne Bay and downtown Miami while relaxing by Mondrian’s iconic swimming pool. Uniquely designed by Marcel Wanders, the pool is set amid sun-soaked lounge pillows, lush gardens hung with hammocks and landscaped into a labyrinthine trail with lounge areas, secret pathways and “kissing corners”. A second level terrace offers flexible entertaining spaces for dining, private events and enjoying the superb sunset views. Cocktails, light fare, spa treatments, and private cabanas are also available poolside. Indulge in the delicious fare created by Executive Chef Dustin Atoigue, available daily during breakfast, lunch, and dinner service. 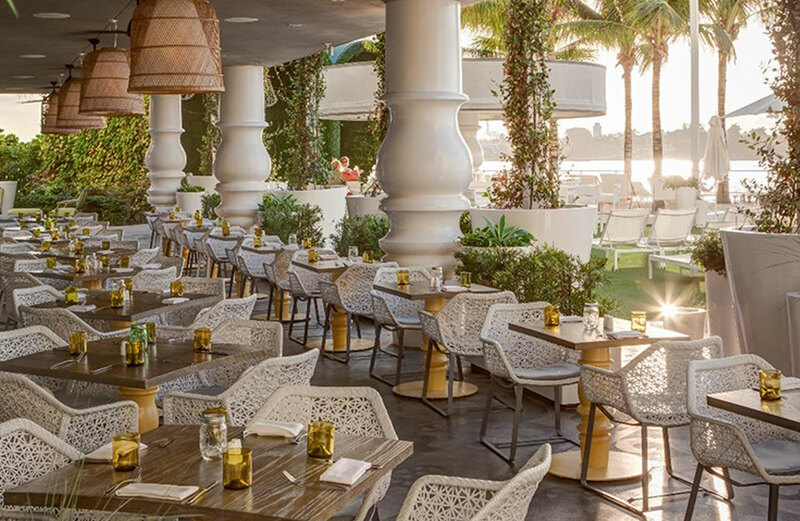 Mondrian Caffè is the perfect place for everything from morning coffee and croissant to our signature fresh Florida Snapper for dinner. Fresh is the key to all of our fare, select from fresh-pressed organic juices, light snacks, to robust pastas, Mondrian Caffè's menu has something for everyone. 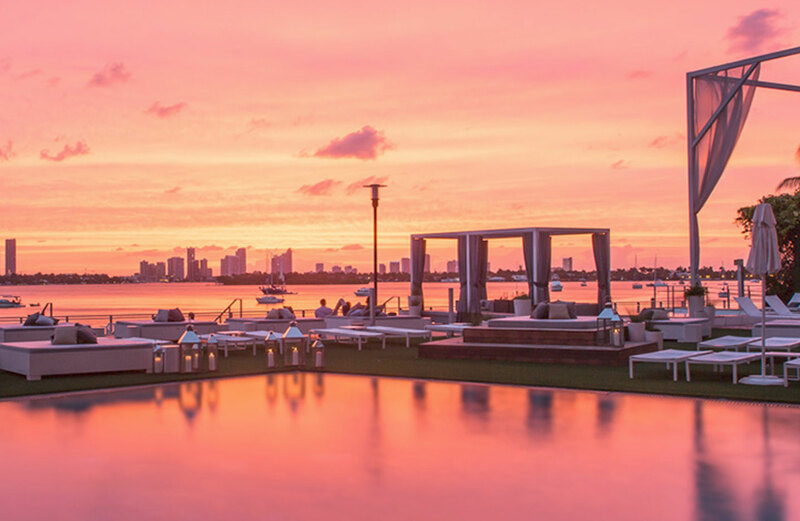 Marvel at the stunning views of the incomparable Miami sunsets from the indoor outdoor bar, all while sipping on your favorite cocktail. Designed by international superstar Marcel Wanders, the lounge is comprised the lobby bar and spectacular poolside area with private cabanas. The Mondrian Bar is dubbed the place to see and be seen by visitors and locals alike. Come and enjoy tasty bites by Executive Chef Dustin Atoigue with selections that cater to every mood and palate. Transport your mind, body and soul to the ultimate South Beach hotel spa. 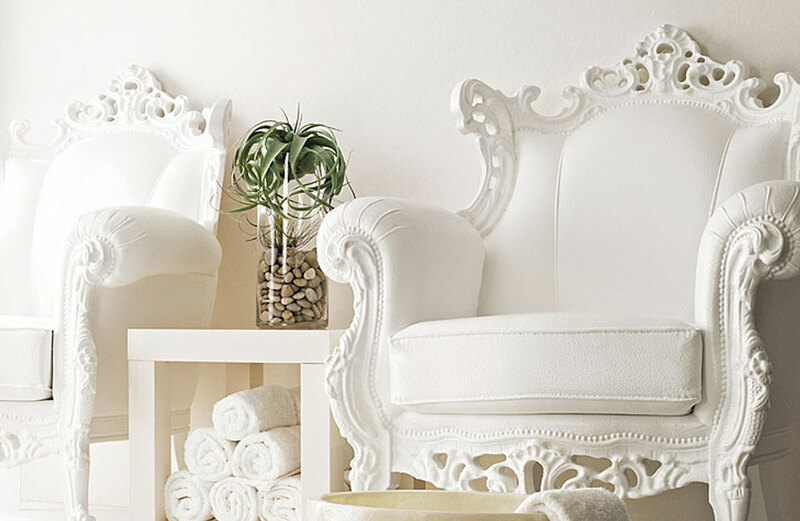 Pamper yourself at one of the best kept secrets of Miami Beach locals, GUYandGIRL Spa. GUYandGIRL features 4,000 square feet of space by acclaimed interior designer, Marcel Wanders. With six treatment rooms equipped to offer an extensive variety of services, we invite you to inquire about GUYandGIRL Spa monthly specials and packages. 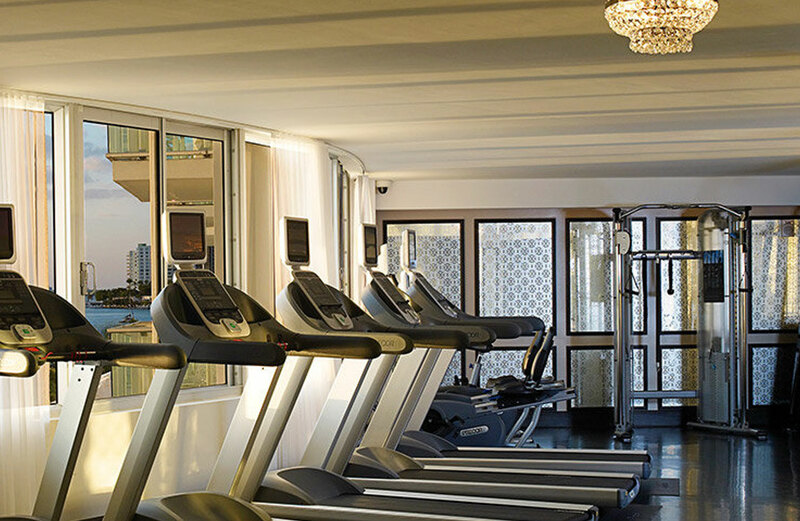 With stunning views of the bay, downtown and Star Island, the Fitness Center features state of the art equipment for all of your workout needs. Located on the 3rd floor and open 24 hours a day.